Why was Holtec debarred as TVA Contractor? 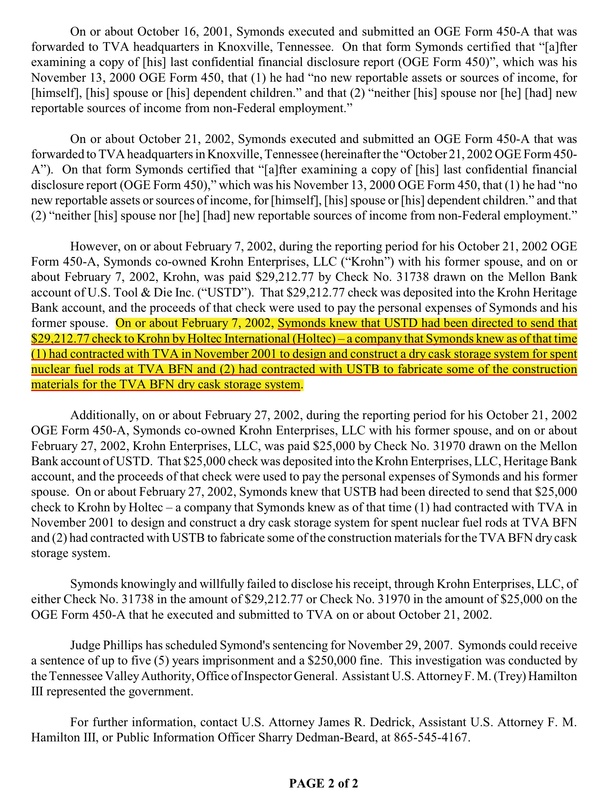 Holtec and the TVA: Fraud? 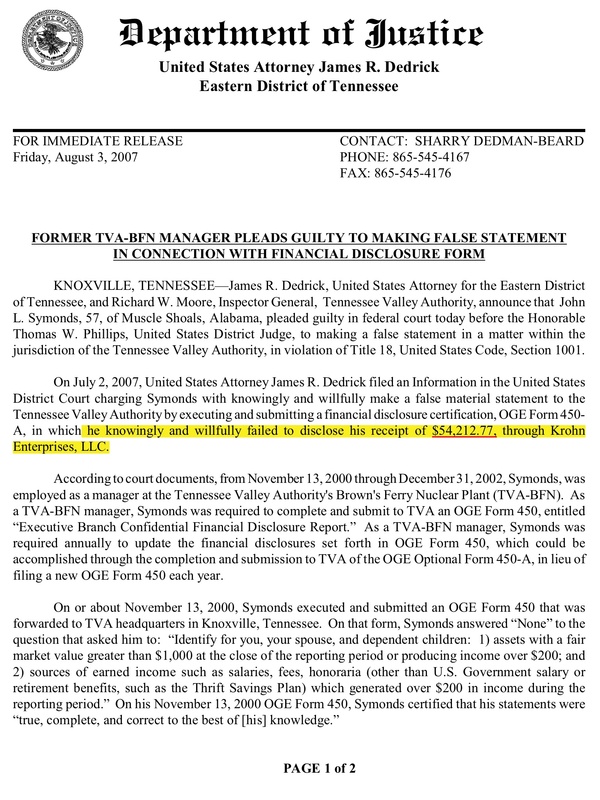 “The OIG initiated a first in TVA history; the debarment of a contractor doing business with TVA. In October 2010, TVA debarred Holtec International, Inc., based on the results of a criminal investigation conducted by the OIG. Because of our recommendation, TVA created a formal suspension and debarment process and proceeded to debar Holtec for 60 days. Holtec agreed to pay a $2 million administrative fee and submit to independent monitoring of its operations for one year. The TVA Board’s Audit, Risk, and Regulation Committee and TVA management fully supported the OIG’s recommendation to create a suspension and debarment process and submit Holtec to that process. TVA’s Supply Chain organization and Office of General Counsel worked collaboratively with the OIG to achieve this milestone in TVA history. How does one contractor being debarred make life better for Valley residents? Ultimately, the less vulnerable TVA is to fraud the better chance rates stay low. This debarment signaled TVA’s commitment to do more than simply ask for the money back. This debarment action was literally heard around the world and drew a line in the sand. Yes, much of this was symbolic, but symbols matter when you are the largest public power company in America. LINE IN THE SAND! MY EYE! PERMANENT DEBARMENT WOULD BE A LINE IN THE SAND! Even 6 years, but 60 days? Come on! Maybe Krishna Singh would call it generosity? A charitable donation? He must be filthy rich, if he is Holtec’s owner. Although bribery in America pre-dated the arrival of Krishna Singh, it doesn’t seem to be an everyday thing like in India: “A study conducted by Transparency International in year 2005 found that more than 62% of Indians had firsthand experience of paying bribes or influence peddling to get jobs done in public offices successfully.” That’s people from India, not American Indians! http://en.wikipedia.org/wiki/Corruption_in_India India is improving but Singh moved to America a long time ago. Old habits die hard, so they say. Was that the case here? A lot and probably most Americans would have no idea how to bribe someone. This gives those who know how to engage in bribery, or its cousins, and wish to do so, an unfair advantage in business, school, employment. 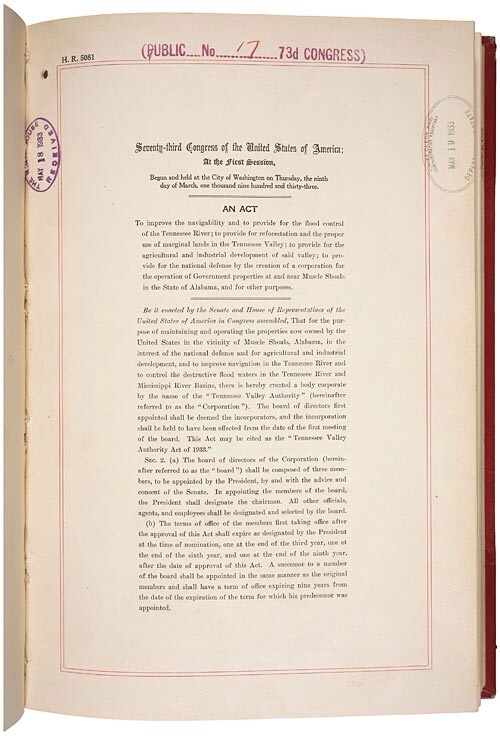 “This act of May 18, 1933, created the Tennessee Valley Authority to oversee the construction of dams to control flooding, improve navigation, and create cheap electric power in the Tennessee Valley basin. “President Roosevelt signed the Tennessee Valley Authority Act on May 18, 1933, creating the TVA as a Federal corporation. The new agency was asked to tackle important problems facing the valley, such as flooding, providing electricity to homes and businesses, and replanting forests. Other TVA responsibilities written in the act included improving travel on the Tennessee River and helping develop the region’s business and farming. 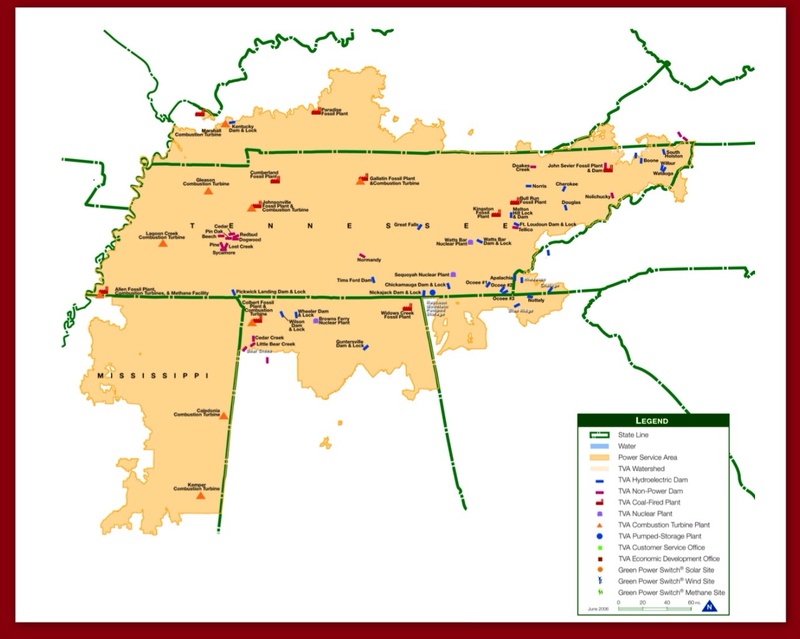 The establishment of the TVA marked the first time that an agency was directed to address the total resource development needs of a major region. TVA was challenged to take on—in one unified development effort—the problems presented by devastating floods, badly eroded lands, a deficient economy, and a steady out-migration. The most dramatic change in Valley life came from the electricity generated by TVA dams. Electric lights and modern appliances made life easier and farms more productive. Electricity also drew industries to the region, providing desperately needed jobs. Metaphorical brown noses from kissing the nuclear industry’s rear end. May 31, 2015 update: The original post stated: “Worse, their storage casks are only between 5/8 inch and 1 1/4 inch thick, depending on the model” and referred to this footnote. However, it turns out that the inner, sealed part, is only 1/2 inch thick, though a slightly thicker 5/8 inch thick has been offered for San Onofre, apparently due to complaining citizens. The differences in thickness, that we had found, had to do with the outer shells, which being vented don’t really count, except for protecting the inner shell from external problems. However, failure of the external parts could lead to puncture. It is very difficult to find information on the specifications. The Hi-Storm 100 specifications for the vented protective cover appear to be an inner metal part which is 1-1/4 inches thick and an outer one 3/4 inches thick and concrete in between. This sounds good until you consider that the concrete wedged between carbon steel can degrade on its own, as well as interacting with the carbon steel, leading to degradation of the metal and the concrete sooner or later, and not necessarily at the same rate. The concrete could break and jab a hole into the metal. There is a randomness to the damage, which depends on contents, material quality, how the materials interact, and the random damage of radiation. More details and references on the Holtec casks may be found in later posts.